Get more done on the go with join.me! Host or join an online meeting from your iPhone or iPad. Join a conference call, host a video conference, share content no matter where you are. Connect to crystal clear VoIP audio, even while sharing a document. And the collaboration doesn’t stop there – you can chat, record a meeting, even use our mobile whiteboard to brainstorm ideas. All in the same personal join.me meeting experience you know and love. Whether at home, at the airport, or in a coffee shop – everyone can join in the conversation with join.me. JOIN Join a meeting, call, or video conference instantly from anywhere. Just type in the meeting code and you’re on the same page, even if you’re hundreds of miles away. START Host meetings with a single tap. join.me lets you host audio calls, video calls, present documents, and share your screen or whiteboards right from your iPad or iPhone. Just one tap starts a scheduled meeting, a spontaneous meeting, or a conference call. Hosting meetings is even easier with iPhone X and iPhone XS! Quickly start all meeting types with simple 3D Touch on the home screen. SEE (what I’m thinking) Collaborate face-to-face from anywhere with the join.me mobile video! You can all join a video only meeting for a quick sync on the go, or give a personal touch to any presentation by using video and sharing documents simultaneously. COLLABORATE Share your iPhone/iPad screen, or share presentations, spreadsheets, images, PDFs and whiteboards instantly from join.me. You can pass the presenter role to another attendee from your iPhone or iPad. Share whiteboards easily via AirDrop, Messenger, or Mail – as well as share directly to Slack, Trello, Evernote, LinkedIn, etc. SAVE Try join.me PRO free for 14 days. 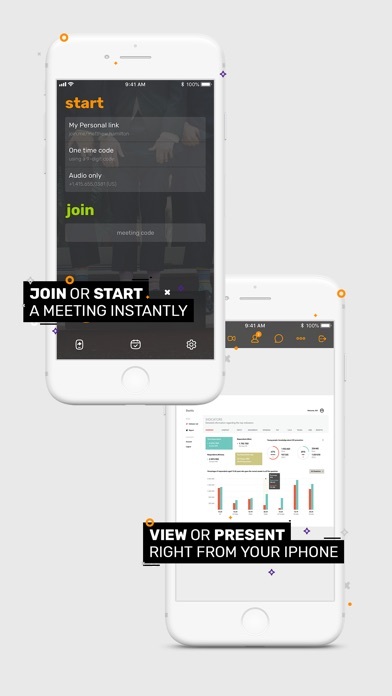 Whether presenting during a meeting or just using join.me audio, there are never any limits or hidden charges. With join.me PRO, take your calls to the next level with a dedicated conference line and local dial in numbers in the US and more than 45 countries. * OTHER FEATURES INCLUDE: • In-meeting chat with all participants at once or individually • Display mode only to external monitor via Apple TV, AirServer, Reflector or via projector showing just the canvas of the whiteboard, no tools (iPhone and iPad) • Meeting lock for extra security EVEN MORE WITH PRO • Create your own personal link (join.me/yourname) • Set your personal, branded background image • Video conferencing for up to 10 participants • Create unlimited whiteboards • Swap presenters during meetings • Includes full access to join.me desktop version too • Schedule meetings right from your app • Your subscription will renew automatically each month and payment will be charged to your iTunes Account within 24 hours prior to the end of the current period. You can turn off auto-renewal by going to your Account Settings after purchase. No cancellation of your subscription is allowed during the active subscription period. Terms of service: https://secure.logmein.com/policies/termsandconditions.aspx SYSTEM REQUIREMENTS: Requires iOS 10 or later. *Roaming, data and other applicable operator or carrier charges/fees may apply. 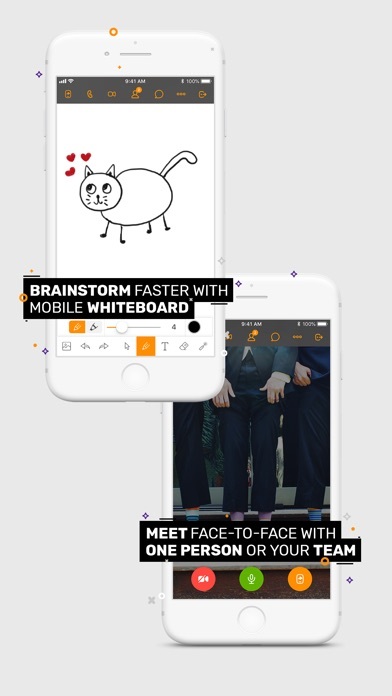 I am planning to use this app to teach students, as I was fascinated by its whiteboard and screen share features on iOS devices. I still haven’t tried an actual meeting yet, but I have noticed two major suggestions to improve. First, the whiteboard should support Apple Pencil, so users can use one-finger gestures like other drawing or note-taking apps and be able to use the double-tap feature on the Pencil 2. Second, the app should support the 2018 iPad Pro screen ratio. Some screen elements around the edge has cut off, and I hope the app could fill the entire screen. I will update the review as I use it for actual meetings and/or once the app is updated. What started out as a great tool turned into my worst nightmare given that I use it on my iPad to stream drawing commissions for my clients. I cannot even start up the screen share broadcast anymore without it IMMEDIATELY canceling the broadcast and crashing every time. I’ve finally given up using Join.me altogether and I hope no one else has to endure this until they fix this program. It works great before but not now. When will it be fixed? I used to use this on my iPad all the time. In fact I would do it even when I sat across the desk from someone because it was more elegant than getting up and walking around and standing behind their back. But lately it forces you to download the app but never seems to go any further on Windows machines. I tried it myself on my Mac and it works fine. Please make it work again. The system is not stable or predictable. Sometimes it works well, other times it is difficult to join or stay joined to a call. It is difficult sometimes to get connected to the audio or stay connected to the audio. The system sometimes just drops your audio, or randomly disconnects you entirely from the meeting. Overall, very difficult tool for meetings. I am in a constant loop of logging in then verifying I am not a robot by identifying numerous obscure photos of bicycles, crosswalks, traffic lights, and buses then once photo identification is completed I am returned to having to log in and the cycle repeats. Maybe this is an app to help you better identify the appearance of bicycles, crosswalks, traffic lights, and buses in photographs? The log in captcha is completely ridiculous!! I just spent an hour trying to install the app on my desktop to work my iPad, and still can’t get it to install. Save your time. Guys make it easy to sign up. After going through more than 10 captchas (!!!) the System kicked me out. And this happened 3 times. Really?? How can ppl sign up for this?